Deliberation about incorporating tablets into the classroom is prevalent. The drive for this change is much closer than we think especially with President Obama’s push to put an e-book in the hands of every student by 2017. As a parent, teacher or administrator the benefits are clear. Schools spend $7 billion on textbooks around the country and most of the books in the classroom have dated material. During my college days, textbook rentals were around $40.00 a pop on each book. Inkling, a San Francisco based company sells books by the chapter for $2.99. My daughter came home from school the other day with a backpack that weighed almost as much as she did. Granted in 5th grade the workload is heavier than previous years but these terribly oppressive backpacks kids have to carry to and from school are hard on their backs and necks. I can’t imagine next year’s backpack load but I’m hoping that all books will be available online. To my surprise, last month I found out that our school has had a shortage of science books. Two of the four 5th grade classes needed to share their textbooks because they were piloting this particular science book. When my daughter came home with her study guide for a science test, I noticed that she didn’t bring her science book home. That’s when she told me that the other class got to take the books home because there weren’t enough books to go around. In this situation, e-books would simply just make sense. Computers take up lots of space. Options are sometimes limited to placing a row of computers against a wall. As students face the wall while working, collaboration and interaction slows down or ceases to exist. Gurnee School District 56 will be implementing the use of iPads for some special education classes to create a multi-sensory product for children with special needs. Kids who might have difficulty using a mouse can use their fingers to drag and get engaged in the application. Tablets benefit children with ADHD and short attention spans by adding another form of learning in their curriculum. Whether you want your child to read a book, learn a language or get extra help with algebra, there are a variety of educational apps that can make learning fun for kids. Some apps are perfect for the classroom while other apps are a nice addition to at home learning. Teachers can have the freedom of creativity with desk placement in their classroom. 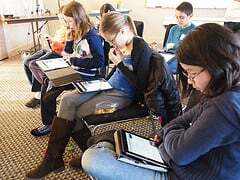 If each student had their own tablet, students could sit on the floor or in groups or any arrangement imaginable instead of being confined to a clunky stationary computer. Tablets will allow children to work at their own pace. Gifted students can work ahead while students that need extra help can get the help they need. Using tablets in the classroom will inadvertently increase student’s computing skills. With the technology industry growing by leaps and bounds, teachers could kill two birds with one stone. Many schools offer resources for students to get textbooks and homework online, imagine the endless possibilities of tablets for your child’s classroom. What kind of PC learning experience does your school provide and what is your view on tablets in your classroom?